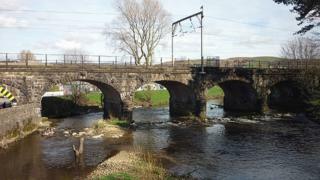 No trains will run between Lancaster and Preston while work takes place to preserve the Wyre Viaduct. There will be bus replacement services between the two stations from Sunday 24 December to Wednesday 27 December. Network Rail is spending £1.8m to strengthen and waterproof the six-arch bridge which carries the West Coast Mainline over the River Wyre. Network Rail will also be carrying out engineering work between Manchester Piccadilly and Manchester Oxford Road. All lines will be closed and services will not run between the two stations. The works on the Wyre Viaduct are set to be fully completed by February.